Approximately 42,000 threatened sea turtles are killed around the world each year -- and that's counting only the ones captured legally, according to a new study from the University of Exeter in the United Kingdom. 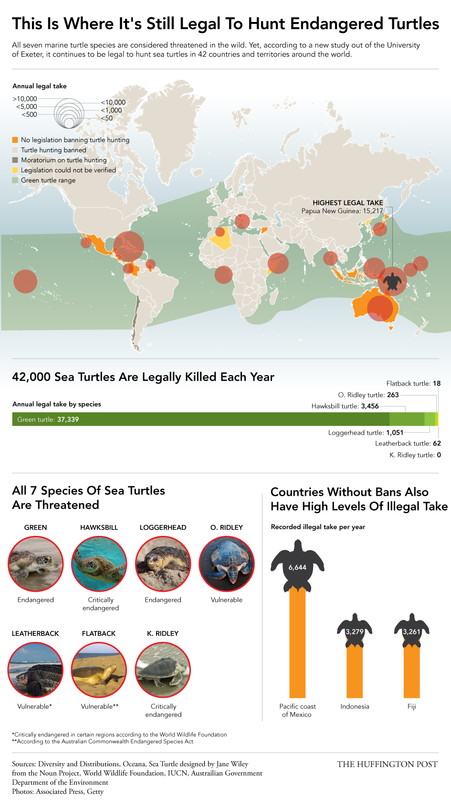 The data shows that legal hunting of sea turtles is allowed in 42 countries or territories, including Australia, Japan and Mexico. Papua New Guinea is said to be responsible for more than 36 percent of the legally taken turtles every year. "Since 1980, we estimate that more than 2 million turtles have been legally taken in these countries," the study's authors wrote. All seven species of marine turtles are considered threatened in the wild. The green turtle -- more than 37,000 of which are reportedly killed legally each year -- is considered endangered by the International Union for Conservation of Nature; while the World Wide Fund for Nature says that the leatherback turtle is critically endangered in certain regions of the world. A hawksbill turtle, listed by the International Union for Conservation of Nature as critically endangered. According to a statement released by the University of Exeter, marine turtles enjoyed better protection internationally in recent years, with 180 countries having signed the Convention on International Trade in Endangered Species of Wild Fauna and Flora, which restricts the international trade of turtle products. However, the Exeter study's authors say that the high number of the animals being killed legally, as well as the continued illegal trade of turtle products and the number of turtles killed as a result of commercial fishing for other species, are all bad news for turtles. "Despite increased national and international protection of marine turtles, direct legal take remains a major source of mortality. However, it is likely that a fraction of current marine turtle mortality take is legal, with much greater threats from illegal fisheries and bycatch," said Frances Humber, lead author of the report, in an email to The Huffington Post. Ultimately, the study's authors say they hope this new report will raise awareness for the sea turtle and will force countries to rethink their hunting policies. They note, however, that they are not calling for a complete ban on turtle hunting, but are urging for the adoption of more sustainable fishing practices. Correction: An earlier version of this post featured an infographic claiming that "countries without bans also do the most illegal killing." This, however, is incorrect. The infographic has since been updated to show that some countries without bans -- -- such as Indonesia and Fiji -- also have high levels of illegal take, though their numbers may not be the highest in the world.